With over 40 acres of lush greenery Sherwood Park attracts visitors to midtown for peaceful walks and a chance to getaway from the hustle and bustle of the city beyond. 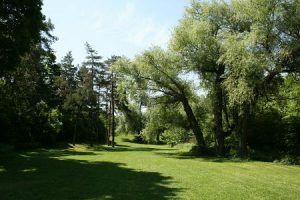 The park was purchased by the city of North Toronto in 1901. A pump house was built for the growing residences and storm water and the park was renamed Waterworks Park in 1920. In 1950 the city modified Burke Brook to accommodate the ever-growing population once again. Many Toronto streams have been intentionally channeled underground to make wayfor roads and buildings. 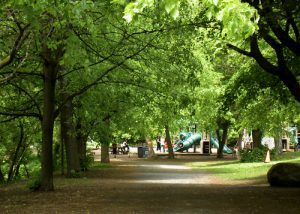 Sherwood is still one of the biggest parks in Toronto with stands of white pine, eastern hemlock, American beech, red and white oak and sugar maples, some trees over 150 years old. To keep the trees healthy, areas of the park are sectioned off to help younger trees grow so they can replace the older ones and they die off. The park also features a well used off leash dog walking area through a heavily wooded areas of the park. The trail is fenced in to allow owners and their pets the chance to commune with nature without disturbing other park users. The boardwalks allow those with accessibility issues to explore the park, while protecting fragile plants in the forest below. To increase accessibility in the steep eastern part of the park, the city has built boardwalks. These boardwalks also help preserve the natural slopes of the park and prevents the young plants from being trampled on. This is also why most sections of the park are bicycle free. The park also houses a playground and wading pool and playground to enjoy. Picnic tables and benches are mounted in quieter areas. The baseball diamond at the foot of the hill accessible from the Sheldrake Avenue entrance is a great place to sit and look over the beautiful landscape In the midst of autumn glory this will be an ideal spot for viewing the glorious oranges, yellows and reds of the leaves changing colour. Sherwood Park seems to have something for everyone, allowing Torontonians a place to escape for an hour or an afternoon without leaving town. Located in the center of the city, it is amazing that such a large body of undeveloped wooded area exists. The Sherwood Park Area (which was within the town of North Toronto) was primarily an agricultural farming community that was incorporated in 1890 as a result of the amalgamation between Davisville Village, Eglinton Village, and Bedford Park Village. They began building houses in the 1890’s when the Metropolitan Street Railway made North Toronto the northernmost stop on its five cent line from downtown Toronto. By the early 1900’s North Toronto emerged as one of Toronto’s most popular commuter suburbs. It was annexed in 1912 and was completely developed by the 1940’s. The areas that we refer to as Allenby and Sherwood Park, both fall within the Toronto Mega City boundaries formed in 1998 and referred to as North Toronto. 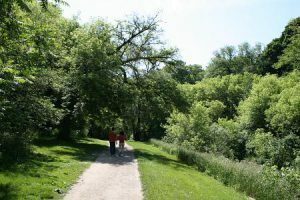 Sherwood Park is a narrow stretch of largely wilderness park stretching west from Bayview Avenue to Blythwood Road. In part of the park, dogs are allowed to run off leash. Lawrence Park – 2901,3055 Yonge St.
A 4.6-hectare park at Lawrence Avenue and Yonge Street that features a children’s playground, three lighted outdoor tennis courts and two lawn bowling greens. The park is home to the Lawrence Park Tennis Club and the Lawrence Park Lawn Bowling and Croquet Club and is adjecnt to the Alexander Muir Memorial Gardens.